- Aladdin only appears on reels 2 , 3and 4 and substitutes for all other symbols except scattered Magic Lamps. 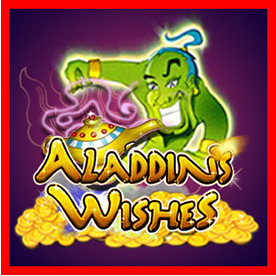 - Aladdin Wishes Prizes is doubled when one or more Aladdins substitute in a winning combination. -All symbols pay Left to Right except scatter Magic Lamps, which pay Left to Right and Right to Left. -Wins on different lines are added. Aladdin Wishes scatter wins are multiplied by total bet. -Line wins are multiplied by bet per line.Maximum win per paid spin is 50,000 times bet per line. - A Progressive Jackpot can be won at the conclusion of any game.The Jackpot is triggered at random Progressive Jackpot wins are added to other wins.Random Jackpot contribution is no more than 1.5% of total Return to Player. -The Player makes picks from the 5 Lamps that are revealed . -One Picks is awarded for each scatter in trigger combination. -lf the Magic Lamp is picked it awards 25 FREE GAMES ,while other lamps will award credit prizes of 2,5,10,25 or 100 times the triggering bet. -Prizes are double during the free games feature. -The feature can be retriggered. -The Aladdin wishes Feature is triggered when 3 or more scatter Magic Lamps occur Left to Right or Right to Left.